A Great Good Morning Everyone! This morning I'm revealing this great sketch by Melissa at Tuesday Morning Sketches and our sponsor for this week Bella Digi Studio. Daphne has generously provided the team with this cute Pumpkin Bear image to whet our appetites for some fall or Halloween cards and a variety of other digis. She has a good mix of digis to chose from if you'd like to hop over and add to your collection. First, I have the card I made with Pumpkin Bear. As I started pulling papers and supplies to put this card together it really made me start looking forward to some cooler fall air, but alas, I think we've got awhile here in TX before that happens. I did a little distressing, colored the image with Copic markers, learned that it's very hard to stamp on this glittered embossed paper, so my vine at the bottom didn't turn out very well, and upon reflection I wish I had added some little gold stars to his hat for just a touch of magic. 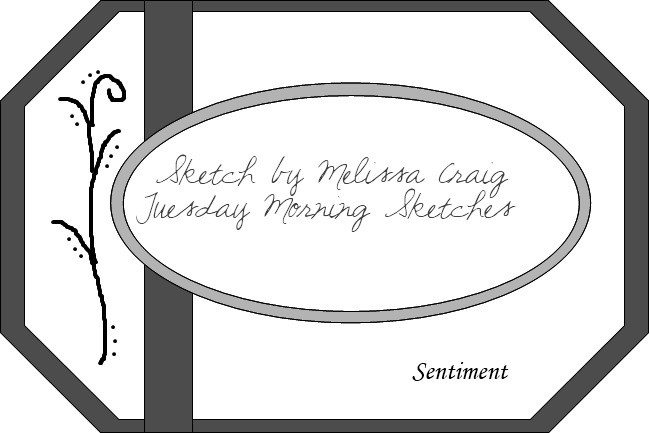 Maybe this card will get your mojo jumped started today to come over and join in the challenge this week. Ahh, but if you're not in the mood for Halloween, I have another take on this sketch for you. As you can see, a more elegant card this time. 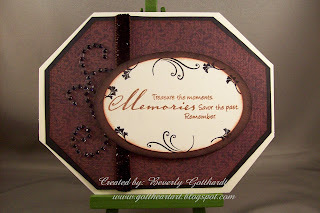 I had this great set of stamps from Hero Arts that just begged to be showcased in this main oval focal point. Some pretty background paper, some rhinestone flourishes, pretty sparkly velvet ribbon, and a stamp and Wah Lah ,you've got yourself a very unique card for a special person. We want you all to participate this week at Tuesday Morning Sketches for fun, of course, but also this week is the judged challenge and if you're like me you can't resist the extra rush of competition. We're looking forward to seeing all your wonderful creations.Good Luck! Supplies: 1st card: White Card Blank 5" X 61/2" Halcraft cut to shape, Papers: JoAnn's-Debbie Mumm Harvest and Holiday Stack, Stampin Up-Whisper White, Always Artichoke, Stamps: Bella Digi Studio, Will 'n Way-Autumn Leaves, Stampendous-Pumpkin Plaque, Inks: Stampin Up-Eggplant Envy, Tangerine Tango, Always Artichoke, Memento-Tuxedo Black, Ribbon unknown, Coluzzle shape template-Oval, mini brads unknown, Copic markers, Sakura white gel pen, Sakura gell roll pen-gold, Stampin Up dimensionals. 2nd Card: Cream Card Blank 5" X 6 1/2" The Paper Studio cut to shape, Papers: DCWV-The Old World Mat Stack, Stampin Up-Basic Black, Very Vanilla, Stamp: Hero Arts-CL156 Treasure the Moments, Ink: Ranger Archival Ink-Sepia, Jet Black, Best Occasions acrylic Rhinestones colored with Black Sharpie marker, Coluzzle shape cutter template-Oval, ribbon unknown, pop dots. Beverly -- your pumpkin teapot bear card is adorable (with awesome coloring) while your Memories card is is so elegant and gorgeous! Beverly your cards are so wonderful! 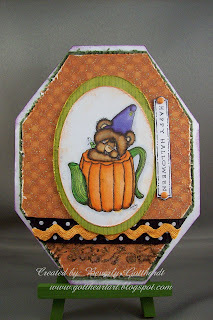 I love the teapot pumpkin bear and your other card is so simple and elegant. Beverly, my sincerest apologies for not commenting on this sooner. I am trying to get caught up. I really like your card. I love the bling.